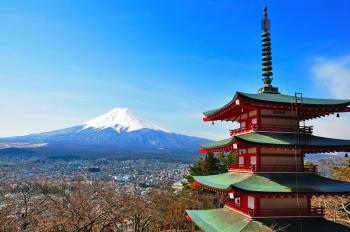 Fujisan is a volcanic mount revered as sacred and inspirational in the Shinto belief. The site consists of a serial nomination of 25 monuments. Pilgrims have climbed this stratovolcano since ancient times. In anticipation of the 2013 nomination of Mount Fuji, I had been looking for an “easy way” to see this site without having to climb the mountain itself. 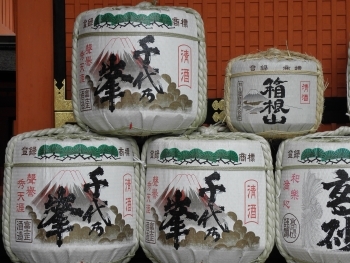 From the limited information available on the UNESCO website, I gathered that the shrines Fujisan Hongû Sengen Taisha (in Fujinomiya) and Kitaguchi Hongû Fuji Sengen Jinja (in Fujiyoshida) are the most tangible parts. I was arriving in the area from the south, and then Fujinomiya is the most obvious choice. Fortunately I had copied down from Wikitravel the information about how to get to the shrine – although it is within a 10-minute walk from the train station, there’s no signage. While getting there, I was looking and looking to see if I could see Mt. Fuji. But it stayed hidden behind the clouds. I thought I had seen a glimpse of a snowcovered peak from the train, but that could have been clouds as well. It is difficult trying to see something that should be there somewhere, but is not visible at all. I even became unsure about in which direction I had to look. So I had to console myself with visiting the shrine, which was erected here already in the 9th century. It is dedicated to the spirit (kami) Konohanasakuya-hime, who is believed to keep Fuji from erupting. It was a place were pilgrims came to purify themselves in water before starting the climb. Compared to the many other Shinto shrines that I haved visited the last week, this is a rather small and quiet place. There’s not a lot “to see”, except for the main shrine and the Wakutama pond (where you can buy a bottle of water from the sacred mountain for 200 Yen). Having been born in Japan and visited Japan numerous times even after moving to the US, I just counted 6 as the number of times I have made trips centered around Fujisan. This is on top of the fact that Fujisan can be seen on clear days from my condo in Yokohama. By making the trips I have visited only 5 out of 25 components of this serial property: Miho no Matsubara, which I visited when I was a pre-teen, Fujisan Mountain Area, where I made the ascent to the top in 1984, Kawaguchi-Ko in 2011, Yamanaka-Ko and an Oshi Lodging House, which I visited on the day of the Fujiyoshida Fire Festival at Kitaguchi Hongu Fuji Sengen Jinja, only a few months after the inscription in 2013.
it is not listed, even though 7 other Sengen Shinto shrines are listed here. Nor is it indicated in our map above. 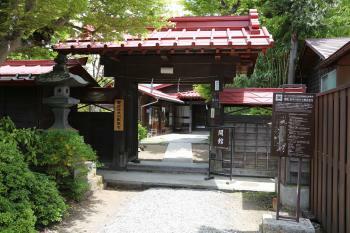 Indeed, all in all 9 Sengen Shinto shrines are included in the property, not just 7, the last one being the Hitoana Sengen Jinja, which is included in the “Hitoana Fuji-ko Iseki” part of this property. In addition, not only Yamanaka-Ko and Kawaguchi-Ko are included in the property, but also the three other Kos among the Fuji Go Ko (Fuji Five Lakes) are also included in the property; the other three are also part of the Fuji Mountain Area. I think this confusion is reflected in the "Integrity" and "Authenticity," as described on the UNESCO site. 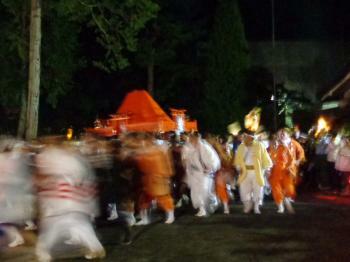 The second half of the Fujiyoshida Fire Festival takes place at the Kitaguchi Hongu Fuji Sengen Jinja. The Festival is known in Japan as one of "Japan's Three Strangest Festivals." The photo shows the red Fujisan “Mikoshi,” or portable shrine, is carried and circled around along with fire on the shrine ground at the climax of the 2-day festival. I visited Togawa Oshi Piligrim's Inn and Kitaguchi Hongu Fuji Sengen-jinja Shrine, both within 20-minute walking distance from Fujisan railway station. Togawa Oshi House was built in 1768 to host numerous piligrims to the Mount Fuji. In the begining of the nineteenth century there were 86 similar inns in the area, now only 12-13 remaining. The House has extensive audio guide descibing each corner of the house and providing general information. The Shrine dating back to the 8th century was the last spiritual stop for the piligrims ascending to the summit from the north side. 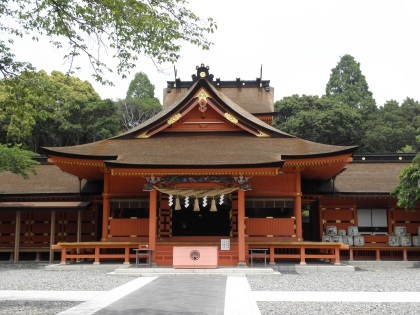 It is located in lovely forest setting (with some sacred cedars which are over 1000 years old), with beautiful garden, painted main hall, big torii gate, and portable shrines used in fire festivals. I visited this WHS in November 2009. It is visible from Tokyo on clear days as well as from the Shinkansen. 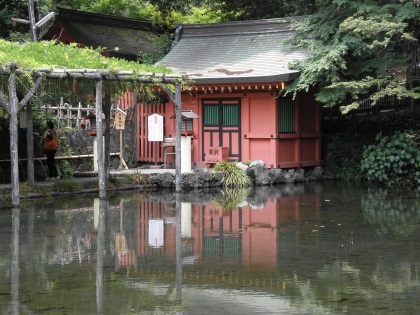 I visited the nearby Shinto shrines and temples, the Fuji Five Lakes and the Hakone viewpoint. 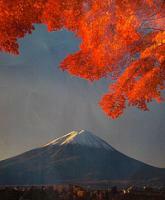 I'm really happy for Japan that Fujisan was inscribed in the list - truly world class! Less than a month after Fujisan has officially been listed as World Heritage Site, my friend in Shizuoka invited me to visit Japan, after read its nomination document and found out a lot of interesting information on its cultural components, I decided to visit Fujisan again to see this beauty in the new perspective. I started my trip at Shizuoka, in the city of Shimizu, where the controversial Miho no Matsubara is located. The place is the large pine forest in the sand peninsular with the view of Fujisan. I really enjoyed the pine forest and the view of Fujisan was quite stunning; however, the view was not exactly similar with the work of Hiroshige and there are many better viewpoints to see Fujisan especially from Izu areas, also the beach was grayish and not lovely at all, so I was not impressed with the place. The view of Fujisan from Yamanaka Lake, one of the Fuji Five Lakes was again lovely from the lakeshore, and then I continued to the village of Oshino Hakkai, I never heard the name of this place before until I read the nomination paper. The village was very touristy with many souvenir shops and restaurants selling soba noodles. The reasons to visit this village are the springs, there are eight turquoise color springs in the village and all are crystal clear and very photogenic. The village also has many traditional houses around the springs so a very beautiful place indeed. I revisited the Kitaguchi Hongu Fuji Sengen Shrine; the great Torii gate is under restoration, I saw the shrine welcomed more visitors with larger car park. 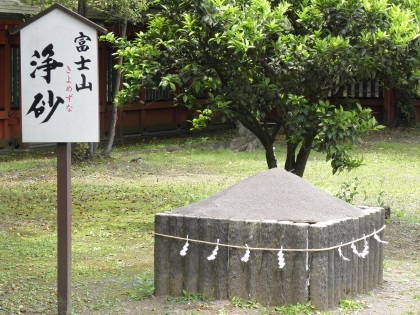 The starting point of pilgrimage route behind the shrine is also looked clean and become a new tourist photo spot. My next place was the heavily developed Kawaguchi Lake, the hotel and restaurant are everywhere along the shore. During my visit there even had lavender festival, so I got a nice photo of Fujisan with lavender field! I loved the small but very clean Lake Sai, the area is very refreshing after all tourism development in Kawaguchi. The area from Lake Sai to Lake Motosu is a very dense forest area called Aokigahara Jukai Forest, here I could not see Fujisan anymore, I visited the Naruzawa Ice Cave, the ice was ridiculous small, but it was very fun and a great place to get some cool in the middle of summer. My group decided to skip Lake Shoji as it was quite out of way, and drove south to the city of Fujinomiya. On the way we visited the sacred Shiraito Falls and Otodome Falls, the entrance to Shiraito falls is closing until the end of this year. The Japanese promised UNESCO to redevelop the area so all shops and hotels are destroyed to create large Japanese gardens with big red bridge. At first I was very disappointed that I could not see Shiraito falls which is a World Heritage Site, a local suggested us to go another side of the river bank for a better view. The falls was indeed very beautiful. My last spot is the Fujisan Hongu Sangen Shrine in Fujinomiya, the brightly red shrine looked very new compared to the much more authentic of Kitaguchi Hongu Shrine. I end of my Fuji circle tour with a highway drive to the city of Mishima, along the way I could see Fujisan before sunset. As I already mentioned in my previous review that I really admired the beauty of Fujisan, but its cultural value was hard to grasp. After I read its nomination document and visited all related site, at first I had to say I still not truly understood its cultural value! But when my Japanese friend reminded me that I had to consider them as Kami or Shinto Spirit under Fuji Cult then cultural value will be comprehensible. His words really enlightened me, Fujisan is maybe the most unique Shinto site in Japanese World Heritage Sites, as other sites are manmade structures, and the sacred natural sites mostly are attached to the Shrine liked in Nara and Nachi Falls. But Fujisan and its surrounding forests, lakes, springs and falls are the center point of whole Fujisan Cult as Kami, not the shrines or any structures. At the end I felt that I started to understand the cultural value of Fujisan but when I saw a photo of jet skier on Lake Motosu, my idea on sacred Kami with Jet Ski were really hard to go together. Horse Stables: Kitaguchi Hongu Fuji Sangen Jinja has a sacred horse stable. Multiple Religions: Shinto & Buddhism: "ICOMOS considers that what is significant is the awe that Fujisan's majestic form inspired and the way that this was transformed into religious practices that linked Shintoism and Buddhism, people and nature, and symbolic death and re-birth"
Reportedly haunted locations : Aokigahara, the forest at the bottom of Mt. Fuji, is a popular location for suicide. This gives rise to a widespread belief that it is haunted. Name changes: At time of inscription, "..Amplifying the name of the property to allow it to reflect its sacred and artistic associations." Cultural landscape not recognized: Described in AB as "to be managed as a CL". If so would be "Assoc"?